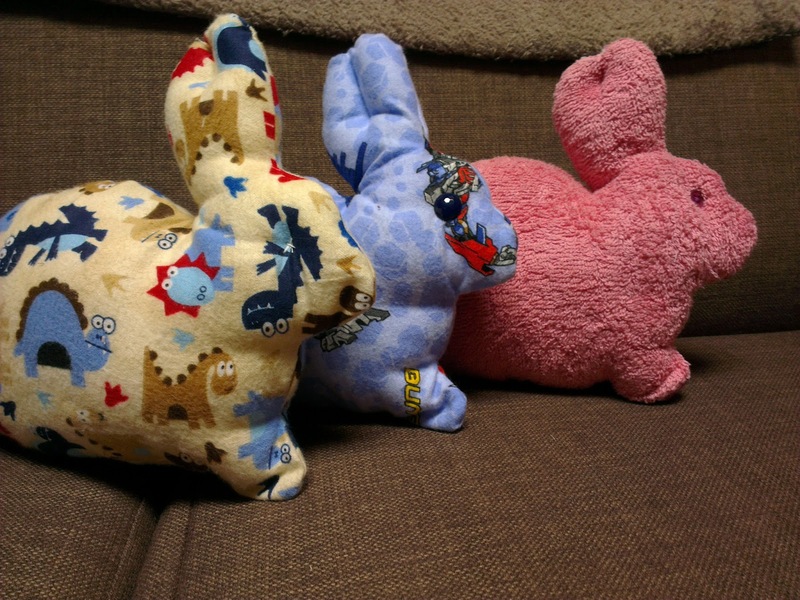 Sew, Stamp, Stitch: Soft bunnies! just wanted to quickly share the bunnies I made for my kidlets. I showed the Faux chenille one I made the other week and I was going to make faux chenille ones for my boys too, but I found a cool flannelette fat quarter bundle at Lincraft and they had 30% pre-cuts .... so I made there's using the same pattern, just no faux chenille! My big boy got the Transformers one and little man got the dinosaur one, very cute and they all cuddled them and were pleased, they didn't even complain that they only got one egg in their 'nest' with the bunny and then just a few others around the house that they had to hunt for! They got lots of treats from grandparents too and also an auntie, plus school/joey scouts and playgroup too, so they did not miss out, but I was pleased to be able to give them something they liked without it being food-related!